If you're interested in the business side of healthcare, an associate in medical office administration online degree can be a great way to get started in the industry. Medical office administrators, also known as medical office assistants or medical secretaries, ensure that medical offices function smoothly. Medical office administrators oversee everyday office operations, organize and maintain patients' medical records, ensure compliance with health insurance policies, and manage health information data to ensure quality, accuracy, privacy, and accessibility. With an online associate degree in medical office administration, you can work in medical and dental offices, hospitals, urgent care centers, insurance companies, social services offices, and assisted living facilities due to the growing demand for these administrators. The U.S. Bureau of Labor Statistics projects a faster than average growth rate of 13% for medical records and health information technicians through 2026. Where can an Online Associate in Medical Office Administration Degree Take Me? Pitt Community College ranks #1 on The 8 Best Online Associate in Medical Office Administration Programs! Pitt Community College, located in Greenville, North Carolina, offers an associate in applied science in medical office administration. This program consists of 76 credit hours, though students may take more depending on the electives they choose. Distance learners can graduate two years. This degree can be fully completed online, and students have access to Pitt's digital library resources and individual or group tutoring sessions. The medical office administration online degree trains students to perform administrative duties specific to working in a doctor's office or other medical environment. Required courses include office application, word processing, medical terminology, medical legal issues, and diagnostic and procedure coding. All applicants must complete a Residency Determination request to determine tuition status (in-state or out-of-state) before submitting a high school transcript and an application to the program. If you are a transfer student, you must also submit official transcripts from the post-secondary institution(s) you previously attended. Pitt Community College is regionally accredited by the Southern Association of Colleges and Schools Commission on Colleges (SACSCOC). 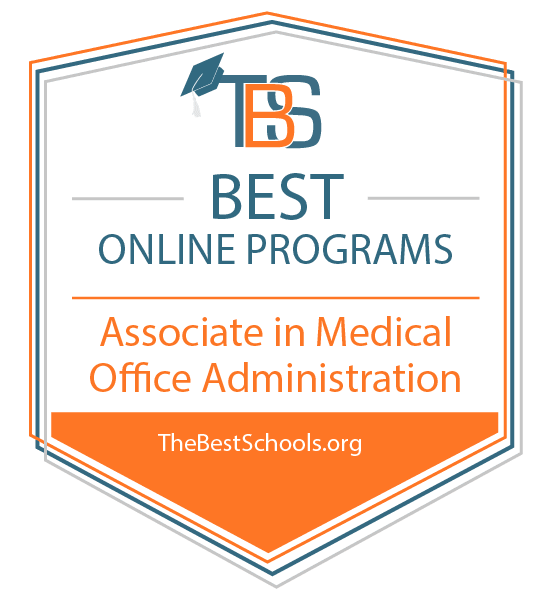 Surry Community College ranks #2 on The 8 Best Online Associate in Medical Office Administration Programs! Surry Community College in Dobson, North Carolina, offers an associate degree in applied science in medical office administration. The AAS degree consists of 67 credits and takes two years to complete. Students learn essential office functions such as keyboarding, word processing, and text editing applications. Courses specific to the medical field include medical terminology; transcription; and medical coding, billing, and insurance. A medical office simulation course helps prepare students for professional employment. The AAS program also requires work-based learning during the final semester, in which students spend a semester working for a college-approved employer. Hands-on experience puts the students' acquired skills and knowledge to use in an office environment. Online students complete the work-based learning requirement in an approved medical office. Academic advising, a digital library, librarian services, and tutoring services are available online for all students. Applicants must first provide proof of residency, and then submit high school transcripts as well as applicable transcripts from any other post-secondary institutions the applicant has attended in the past. If you have recently transferred to North Carolina for your employer and the employer pays for tuition, you can qualify for in-state tuition, even though you are not yet a North Carolina resident. Surry Community College is regionally accredited by the Southern Association of Colleges and Schools Commission on Colleges (SACSCOC). Southwestern Community College ranks #3 on The 8 Best Online Associate in Medical Office Administration Programs! Southwestern Community College in Sylva, North Carolina, offers an associate degree in applied science in medical office administration. Consisting of 66-67 credits, the program can be completed in two years, including a summer semester. All coursework can be completed online, including courses with labs. As an online student, you have access to several services, including academic advising, student support services, and tutoring. The curriculum for the medical office administration online degree includes administrative and medical topics, such as records management and database concepts. Specialized medical courses cover insurance and billing, legal issues, and terminology. In the final semester, students must complete both a medical office administration capstone course and an office administration capstone course to demonstrate what they have learned. Applicants must submit a high school transcript or GED. You must provide proof of North Carolina residency to qualify for in-state tuition. Online students from other states will be charged out-of-state tuition. Transfer students must submit transcripts from any previously attended post-secondary institutions to receive credit. Southwestern Community College is regionally accredited by the Southern Association of Colleges and Schools Commission on Colleges (SACSCOC). Lenoir Community College ranks among The 8 Best Online Associate in Medical Office Administration Programs! Through Lenoir Community College in Kinston, North Carolina, you can earn an associate degree in applied science in medical office administration online. Students can also potentially earn several certificates related to medical office administration while completing the AAS. The curriculum consists of 73 credits hours, which can be completed over four regular semesters. This includes general education classes; courses on administrative, clerical, and medical topics relevant to the degree; and a capstone. Students enrolled in distance education have access to online tutoring services; digital library materials and academic, career, and other counseling services. As with most online colleges for medical office administration, if you choose any work-based learning electives, you will be required to work in a local office to develop hands-on professional experience. Applicants must submit high school transcripts; transfer students must submit transcripts from previously attended post-secondary institutions. After North Carolina determines your residency status and Lenoir receives your transcripts, you must take a computer placement test. The placement test establishes what general education courses you must take to complete the associate's degree. Lenoir Community College is regionally accredited by the Southern Association of Colleges and Schools Commission on Colleges (SACSCOC). Wake Technical Community College ranks among The 8 Best Online Associate in Medical Office Administration Programs! Wake Technical Community College offers an associate of applied science -- medical office professional degree. The degree requires students to complete 66 credits of coursework, which can done in two years. General education classes, along with courses on medical office procedures and tasks, help students develop the critical thinking and problem solving skills necessary for the demanding environment of a medical office. Capstone courses in office administration and medical office administration are required in your last semester. Students have the choice of a concentration in medical billing and coding or healthcare administration. All courses can be completed online. Free tutoring services are also available to online students. After a North Carolina residency determination, submit an application along with high school transcripts and any relevant post-secondary transcripts for credit transfer. Next, you can take a placement test to determine the appropriate starting courses you must take, or apply for exemptions based on your previous academic career. Then you can meet online with an academic advisor and plan your first semester. Wake Technical Community College is regionally accredited by the Southern Association of Colleges and Schools Commission on Colleges (SACSCOC). Wayne Technical Community College ranks among The 8 Best Online Associate in Medical Office Administration Programs! You can earn an associate degree in applied science in medical office administration online at Wayne Community College in Goldsboro, North Carolina. The program consists of 70 credits completed over four semesters. Several classes focus on developing computer skills for applications commonly used in medical offices. Students also take courses on medical terminology; professional research and reporting; coding billing, and insurance; medical legal issues; and medical office transcription. Wayne offers students a preparatory course which prepares them to sit the Certified Professional Coder exam offered by the American Association of Professional Coders. Your entire medical office administration online degree can be completed online; however, if you choose a work-based learning elective, you will need to work in person at an approved local medical office to get hands-on professional experience during at least one semester. Online students can take advantage of online tutoring services provided by the Academic Skills Center, as well as the online writing center. Digital library resources, academic advising, counseling, and career services are also available. Verified North Carolina residents qualify to pay in-state tuition rates. Determining your state of residency is the first step of the application process. Applicants must provide transcripts from their high school, as well as transcripts from any post-secondary school for credit transfer. You have the opportunity to place out of introductory classes. Wayne Community College is regionally accredited by the Southern Association of Colleges and Schools Commission on Colleges (SACSCOC). Guilford Technical Community College ranks among The 8 Best Online Associate in Medical Office Administration Programs! Distance learners can earn an associate degree in applied science in medical office administration online at Guilford Technical Community College in historic Jamestown, North Carolina. A general degree is available, or you can choose a concentration in healthcare administration or medical billing and coding. Certificates in software applications or medical office billing and coding are also available. Courses prepare you to take Microsoft Office User Specialist exams. The general degree consists of 66 credits, which can be completed over two years, including four standard fall/spring semesters and a summer semester. Coursework for the online associate degree in medical office administration helps students develop their communication skills and prepares them to manage records both electronically and manually. The program also includes an office administration capstone course in the final semester. Guilford offers a work-based learning elective; online students must work in an approved local office for a semester if they so choose. Students have access to several benefits, including academic advising, online tutoring, career services, and counseling services. Students from North Carolina pay in-state tuition rates. Applicants must submit high school transcripts as well as transcripts from any post-secondary institution where they previously earned credits. Guilford Technical Community College is regionally accredited by the Southern Association of Colleges and Schools Commission on Colleges (SACSCOC). Pueblo Community College ranks among The 8 Best Online Associate in Medical Office Administration Programs! You can earn an associate degree in applied science in office administration at Pueblo Community College, based in Pueblo, Colorado. This program features an optional medical office professional emphasis, which provides graduates with a certificate along with the degree. The medical office professional program consists of 62 credits, which can be completed in just two years. Courses include principles of supervision, project management, human relations, workflow fundamentals of healthcare, and disease process and treatment. The entire medical office administration online degree can be completed remotely, with the exception of the three-credit cooperative education/internship. Through the internship, students gain practical experience working a total of 135 hours at a local medical office. Computer-aided tutorials and digital library resources are accessible to online students. Colorado residents who attend online pay in-state tuition rates but may be eligible for a tuition reduction through the College Opportunity Fund. Non residents must pay out-of-state tuition but are not eligible for a tuition reduction via COF. Applicants must submit high school transcripts and establish placement for general education courses through testing and transfer of any existing post-secondary credits. Pueblo Community College is regionally accredited by the Higher Learning Commission. When researching online colleges for medical office administration, consider your long-term career goals. Some states require bachelor's degrees and licenses for medical office assistants working in assisted living facilities or nursing homes. A bachelor's degree can also open career paths into health information management or healthcare administration. Healthcare Administration: Careers for graduates in healthcare administration include program development, claims management or underwriting for insurance companies, human resources roles in government offices or schools, and policy development for public interest groups. Health Information Management: Graduates in this field often pursue careers in medical data analysis. They may consult for pharmaceutical companies, public health agencies, or software vendors. Business Administration: Careers in healthcare for business administration graduates include nursing home administration, accounting or marketing for a healthcare business, operations management, sales management, social media management, or project management.